Whilst watching the Brazil vs Japan game the other evening, I noticed that a lot of the players' names end in "inho" and wondered is this was like "Kip" in Kenyan names (I believe Kip means "son of"). Most Brazilian players are known professionally by either a nickname, or one or more names extracted from their full names. Often the nickname is a diminutive (ending in "inho" or "zinho" meaning little) or an augmentative (ending in "Ã£o" or "zÃ£o") of the first name. Pele's real name is Edson Arantes Do Nascimento. Ronaldo de Assis Moreira is Ronaldinho while not to be confused with Ronaldo who is Ronaldo Luiz Nazario da Lima. Thanks goodness. Imagine Ronaldinho having his full name on the back of his shirt. 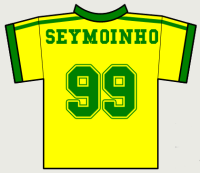 You too can now have a Brazilian name and a nice little printable shirt, with your own number.